Pancakes don’t always have to be circular in shape. This Austro-Bavarian torn pancake specialty (translated: Emperor’s mess) contains raisins which have been soaked in Rum. After baking the pancakes in a skillet they are torn with a fork into irregular shapes and then re-fried again, dusted with powdered sugar and served with a hot blueberry compote on the side. You can eat Kaiserschmarrn as a dessert or main meal for lunch which makes a quite filling meal. Cover the raisins or sultanas with Rum (alternatively use grape juice instead of Rum if serving to children) and let soak in a bowl while you are preparing the other ingredients for at least 30 minutes. Separate the eggs carefully. Whisk the egg whites in a clean bowl until stiffened. In a second bowl add the sieved flour, pinch of salt, the melted butter, the milk and the egg yolks and mix all ingredients using your hand mixer. Drain the in Rum soaking raisins and fold them into the batter. Add the whisked egg whites and fold into the batter carefully. Pour the batter (about 1 cm or 1/2″ tall) into a pre-heated cast iron or non-stick skillet with little butter and bake on both sides until golden in color. Never mind if pancakes break when flipping them over. Tear baked pancake using two forks into irregular shapes, stir and re-fry the pancake pieces covered with a lid for another minute or so. 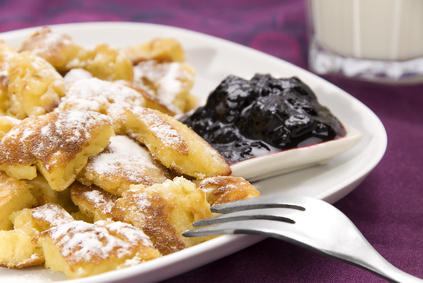 Place torn pancake (Kaiserschmarrn) on a plate and dust with powdered sugar. Serve with a hot blueberry compote/sauce on the side. You can make your own berry compote using this method: Place your blueberries (or other favorite berries) in a small pot, add water and the sugar, stir and simmer covered on low heat for 5 minutes. If preferred you can blend the cooked sauce in a blender. Serve berry compote in a small dish on the side with your Kaiserschmarrn. If you make Kaiserschmarrn for many people you can bake/re-fry it in batches then place each batch in an oven safe dish, dust each layer with powdered sugar and keep warm covered with tin foil on low heat in the oven until ready to serve. Other variations of Kaiserschmarrn can include shaved/chopped almonds or nuts, small pieces of apples, cherries. Blueberry sauce can be substituted with apple sauce, lingonberry sauce, cranberry sauce etc. Peel apples, cut in fine slices and steep with sugar and rum. Cut rolls in fine slices and moisten with milk. Beat butter until creamy, mix in egg yolks, sugar, cinnamon, lemon peel and grated almonds. Beat egg-whites separately until stiff. Fold together apple slices, raisins and whipped egg-white with the butter-yolk mixture. Grease an ovenproof baking dish and sprinkle with bread crumbs. Alternate bread slices layers with apple mixture and top with small pats of butter. Bake Ofenschlupfer in the oven at 180-200 degrees C for 30-40 minutes. The top should be slightly brown. Instead of butter you can also spread whipped egg-white over the Ofenschlupfer after about 20 minutes of baking time. In this case beat 2-3 egg-whites together with 4 tbsp sugar until stiff and reduce quantity of sugar for apples. Enjoy my easy bread pudding recipe on its own or with a thick creamy vanilla sauce. Mix together the almonds, bread crumbs, cornstarch, baking powder cinnamon and lemon peel. Peel the carrots and the apples and grate them finely. Separate the eggs. Beat together the egg yolks with 4 ounces of the sugar. Beat the egg whites together with the salt and the rest of the sugar. Mix the grated carrots and apple with the egg yolk and carefully fold in the egg white mixture and the almond mixture. Line a 10 inch spring form with baking paper and pour in the batter. Bake in a pre-heated oven at 350 degrees F for 45 minute. Remove from the oven, loosen the cake from the form and allow to cool on a baking tray. For the decoration, break up the marzipan and knead it together with the confectioners’ sugar, divide into 3 portions and color each portion pink, yellow and brown (using the cocoa powder for brown). Place the marzipan between two layers of plastic wrap, roll out and cut out Easter eggs shapes and branches. For the glaze mix the egg white with the confectioners’ sugar. Put the glaze in a plastic sandwich bag and cut a tiny corner. 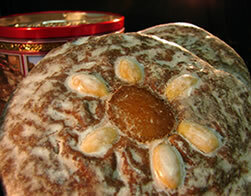 Use the glaze to decorate the marzipan eggs with fine lines. Sprinkle the cake generously with confectioners’ sugar and decorate with the marzipan eggs and sugar flowers and leaves. In a frying pan, fry the bacon until crisp. Remove and drain on paper towel. Remove the bacon fat from the frying pan, add the butter and saute’ the onion until soft. Add the potatoes and brown lightly. Beat the eggs lightly and add the salt, pepper and milk, and finally the chopped bacon. Pour the egg mixture over the onions and potatoes and stir occasionally until cooked. Cut slits (1 in. deep) on top and sides of roast and insert slivers of garlic. Combine salt, pepper, sugar and cloves in small bowl. Spread mixture over roast, using hands to rub it in. 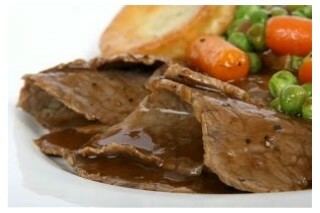 Spread mustard in a thin coat on sides and top of roast. Put lamb on rack in roasting pan. Add broth or water. Cover. Bake 2 hours, basting every 15 minutes with cooking liquid. Remove cover and continue to bake and baste until lamb reaches internal temperature of 175° F. (takes about 30 to 60 minutes more). Add extra water if needed. Strain cooking liquid and serve with roast. Wash the veal shank with cold water and cut the back bacon into thn slices. 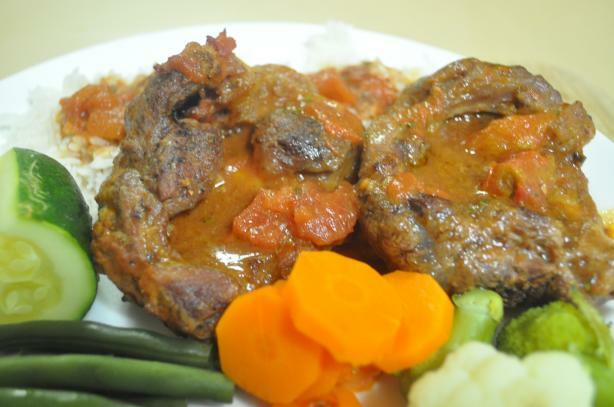 a roasting dish, then put the veal shank on them and cover it with the remaining bacon slices. Put the cap on it and fry it in the oven for 40 minutes at a temperature of 200°C. Pour in 1 cup of broth and then stew it in the closed roasting dish for another 40 minutes. Remove the cap and cook it for another 40 minutes at a temperature of 180 °C. Pour the sauce over sometimes. cornstarch. Season it with the white wine. Preheat oven to 325° F. Grease and flour 2 8-inch layer pans with removable bottoms. Cream butter and sugar. Beat in egg yolks. Mix together flour and baking powder. Add to butter mixture. Add milk and almond flavoring and mix well. Beat egg whites until frothy (soft peak stage). Gradually beat in sugar and baking powder until stiff and glossy. Bake cake until cake tests done and meringue is set, about 35 to 40 minutes. Cool. Remove cake from pans. Let cool on rack. Place one layer on serving plate with the meringue side up. 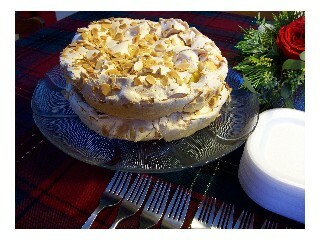 Place other layer on top with meringue side up. Remove from heat and add butter. Cool and add flavoring.